In October 2018, think3D opened India’s largest ever 3D printing facility in Vizag. Spanning across 17,500 sq.ft, the company’s integrated 3D printing facility houses a 3D Design, 3D Scan, 3D Print, and a batch production center. A manufacturer can come to think3D facility with an idea and leave with a small batch of finished items that they can assemble in their facility. 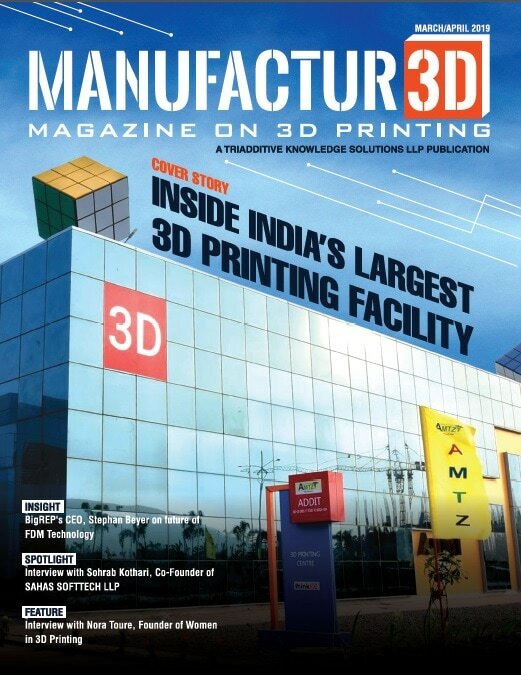 We thought of taking a look inside the facility and know more on how the journey towards the creation of India’s largest ever 3D printing facility began. In his first ever interview to an Indian media, Stephan Beyer, CEO of one of the leading manufacturers of FDM 3D printers, BigRep shares his thoughts on the future of FDM technology. Speaking exclusively to Manufactur3D, Beyer also highlights the challenges that FDM technology faces, and what companies can do to address these challenges. In our SPOTLIGHT section, we bring some of the young, dynamic and emerging entrepreneurs in the Indian 3D printing industry into the spotlight. In this edition, we interview Sohrab Kothari who leads SAHAS Softech LLP, one of the leading 3D printing service bureaus in India. This young entrepreneur from Mumbai shares his journey so far in India’s 3D Printing industry. In a comprehensive interview, Nora Toure addresses a major issue in the additive manufacturing industry: the gender gap. In an exclusive discussion with Manufactur3D, Nora explains the background for the creation of Wi3DP, the impact that it has had on increasing the role of women in 3D printing, and what women currently in the industry can do to become more competitive.